Every GSA looks a little different, and every GSA meeting looks a little different. 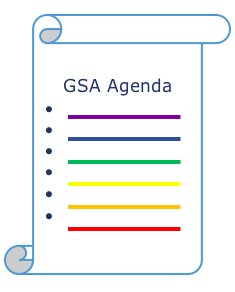 Whether your GSA acts more as a social-support group or focuses on activism and education, there are a number of elements that go into running a meeting that will feel successful and meaningful. Prepare: It’s easy to think that we can just walk into a meeting and facilitate “off the cuff.” But take a lesson from your teachers: Even those who have been teaching for three decades still create lesson plans and don’t start class without having put some thought into how they’ll fill that hour of class time. Create an agenda: An agenda is simply an outline of what you want to accomplish in the meeting. It doesn’t have to be very detailed, but it should include everything you want to cover and assign time limits to each item. If your meeting starts with a check-in (and it should! ), put that on the agenda. If you only have an hour for your meeting and your check-ins take 25 minutes, that doesn’t leave a lot of time for anything else. An agenda should be realistic, adaptable, and it should prioritize the most important items at the top. Facilitate, don’t lecture: A GSA meeting should create space for all members to participate in some way. If the leaders of the GSA are the only ones talking, other members might feel discouraged or left out. A good facilitator asks lots of open-ended questions, pays attention to who is contributing a lot and who hasn’t said much, and works to keep things moving along. Be flexible: Sometimes a GSA leader becomes so focused on what they want to accomplish in a meeting that they forget that some students come to GSA looking for support. If a new student comes to GSA, or if a student wants to share something personal, there should be space for that. However, you don’t have to let students dominate GSA with their personal drama. Work with your advisor to create a balance and find additional resources for students who really need it. Consistency is key: If your GSA meetings are constantly changing the day and time they meet, membership will likely drop off. Use posters, announcements, and social media to remind students of upcoming meetings. Consider creating a calendar of meetings and alternating between business/work meetings and meetings that are more social in nature. Post it online and in your advisor’s classroom or office. Read the room: If it feels like the energy is low or people are tuning out, don’t try and force it. Check in with members and consider taking a break or doing an energizer activity. If tension or conflict arises, look to your advisor for support and revisit your GSA’s group agreements to help resolve it.